(Sacramento, CA- June 3, 2016) On Wednesday, May 25th, Transfer Flow, Inc. was honored by Assemblyman James Gallagher at California Small Business Day. 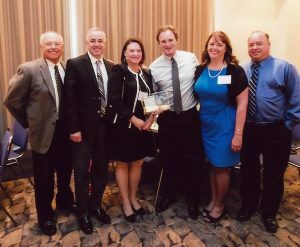 As Small Business of the Year for the Third Assembly District, Transfer Flow, Inc. was celebrated for their hard work and dedication to the community. California Small Business Day honored 85 small businesses for their contribution to the state’s economy. Small business contributes to 75% of California’s gross state product and over half of the state’s private sector jobs. From hardware stores to manufacturers, small businesses are engrained in California’s communities and economy. The Transfer Flow story began in 1983 in the beautiful and historic town of Chico, California, when former General Motors engineer Bill Gaines, along with his wife Jeanne, founded the company as an OEM fuel system supplier for the motorhome and travel trailer industry. The business quickly expanded into the mobility, work body, and mainstream automotive industries, and by 1994 the company relocated to a 35,000 square foot manufacturing facility as demand continued to grow. Six years later, a 20,000 square foot building was built on an adjacent 3-acre parcel, and finally in 2008, a 15,000 square foot warehouse was added. Today, Transfer Flow continues to invest in new technology and state-of- the art manufacturing equipment, while employing a dedicated and hardworking staff of more than 90 people from across Northern California.